A remodeling project that combines universal design and green remodeling can be a strong seller in today’s weakened market, particularly with baby boomers “coming of age,” according to Mike Vowels, of Stewardship Remodeling in Seattle. Vowels sees a strong link between the two remodeling concepts because both involve consumers planning for their futures and incorporating sustainability in a home. But Vowels also cautions that designing the remodeling solution offered to potential clients has to be “seamless and invisible,” or consumers won’t find it appealing. Instead of using the term, “roll-in shower,” for example, Vowels talks to his prospects about curb-less European showers. Instead of ramps, he discusses step-less grade changes leading to the front entrance or back patio. Vowels markets and sells universal design and green remodeling as a total home remodeling solution rather than as two compatible concepts. The most effective way to accomplish such a seamless remodel, Vowels says, is to anticipate future needs, plan accordingly and integrate the universal design and green solutions. “It’s about how smart your house can be,” says Vowels. For example, a design that plans for future changes can include stacked closets that are properly sized so that they can be converted into an elevator shaft later, if needed. Such pre-planning meets the home owner’s needs now and their changing needs in the future. The approach makes the whole remodeling project much more marketable and easier to sell because there are more features and benefits to sell — and because they work together, he says. “Unlike a carton of milk or a steak, the function, safety and comfort of your home should not have an expiration date on it,” Vowels says. Economic Sustainability — An energy-efficient home will have lower operating costs (e.g., utilities) and coupled with universal design, the home will be more marketable to a broader population. Long term, a home with green features and universal design is a good investment. Environmental Sustainability — A home incorporating universal design is remodeled to anticipate the transitions linked to aging. This lessens the need for ad hoc changes in the future that are age related and less seamless. Social Sustainability — A home incorporating universal design provides visitability for people of varied abilities and enables home owners — and sometimes whole families — to stay in their same home (aging-in-place) and continue living in their same community. The overall combination of benefits that result from combining universal design and green remodeling into one seamless remodeling solution is helping Vowels differentiate his company from his competition. “We’re trying to distinguish ourselves on universal design by showing the attractive side of a very prudent choice for our customers to consider,” Vowels says. The Stewardship Remodeling Web site, www.universalandgreen.com, and all the company’s marketing materials help focus its branding and reinforce the reason to integrate the two remodeling concepts. Universal design and green remodeling, Vowels says, answer the current and future needs of prospective home owners by creating a finished product that is timeless in its use, contributes positively to the environment and is sustainable. 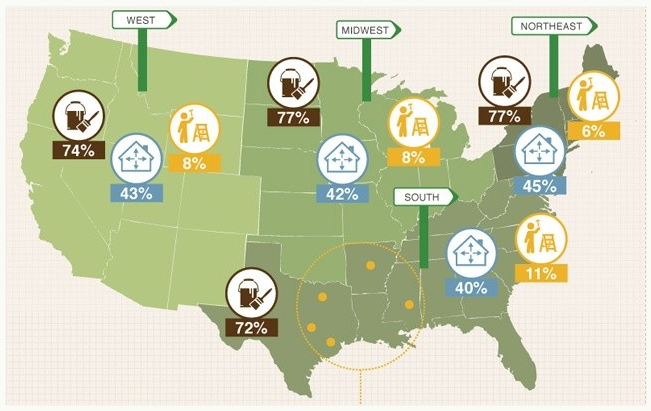 Planning for aging-in-place renovation work among remodeling clients increased 10% during the past three years, according to a recent survey by the NAHB Remodelers. In the survey, 70% of remodelers reported making universal design home modifications, up from 60% in 2006. While the survey indicated that most of the clients requesting the aging-in-place modifications were 55 and older, remodelers also reported a growing number of younger consumers who wanted these modifications in their homes to make it easier for visiting relatives with age-related disabilities, to make it easier for grown children to share living space with their parents or to plan ahead for future needs. NAHB’s survey also indicated that consumers are becoming increasingly aware of aging-in-place and universal design options. Eighty-four percent of the remodelers said that home owners have at least some knowledge of universal design solutions. For more information about aging-in-place remodeling, visit www.nahb.org/aginginplace.